Lately I’ve been thinking about the lessons that user experience designers can learn from filmmakers. When I first started researching this concept, I thought that the key discovery would be related to storytelling. I thought that there would be an undiscovered process or method that we could take from film and apply to products. But, turns out, that’s not it. I think the greatest lesson we can take from filmmaking is not the art of story – but the art of decision making and the role of the director. 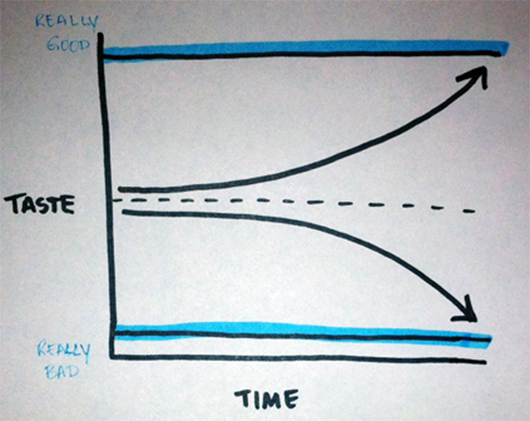 One of the greatest challenges in any project is to maintain that precious momentum forward (and hopefully, upward). Without continuous progress, you aren’t learning anything, and a huge amount of our time is spent learning about people, industries, and how things work. The primary reason for loss of momentum, I believe, is a decision that either wasn’t made, or wasn’t the right decision. Decisions can be the death or life of a project and a team. Therefore, to maintain that momentum, you need to have a director – a chief decision maker. I discovered a talk that John Gruber gave at MacWorld in 2009 that touches on exactly this idea. John has a concept called the Auteur Theory of Design. The theory is derived from a french theory of film, the Auteur Theory of Filmmakingthat suggests the best films will have the director’s imprint and evoke their personal views and vision on the film. In essence, the directors are the authors because it is the sum of their decisions that influence the film. This shows two scenarios. If the director of your project has a higher than average level of taste, then over time, the quality of your project will climb upward. However, if the director of your project has a lower than average level of taste, then over time, the quality of your project will decline. So next time you are working on a project remember three two things. First, that since user experience is at the center of a project, where all teams intersect, you have a responsibility to set the bar of taste, of quality. But second, remember that you are not the hero. Ultimately there is a director, an auteur, who gets to make the final cut. PS: To learn more about John Gruber, you can visit http://www.daringfireball.netor follow him on Twitter.